Ohhhhh, the greens!!! The whole reason I plant a fall garden is to have greens of all kind at my disposal whenever I want them. I plant all kinds....mustard greens, turnip greens, collard greens, kale, you name it, I love it and I grow it!!! One might venture to think that having such produce at my finger tips would mean I lead a healthy, organic, Whole Foods filled lifestyle....you would be mistaken! As a child born and bred here in the Southeastern United States there are some things that you know from an early age.....The Civil War is often times referred to as the War of Northern Aggression, anything can be smoothed over with a properly places "Bless her heart", only those tacky folks wear white after Labor Day, Steel Magnolias is practically a theme movie and greens are always cooked in bacon grease! Cook 'em the longer the better, until every redeeming nutritional factor as been successfully eliminated then simply add some salt, pepper and a heaping tablespoon of bacon grease (which of course you saved from breakfast) and my friend, you have officially cooked greens the good old fashioned way! Head straight on out to the garden (or your closest grocery store) and get you some greens! 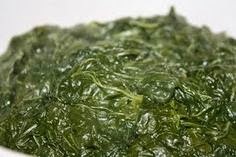 I like to mix it up and combine mustard and turnip greens but you can do whatever you prefer! One key factor you absolutely must know when you cook greens is to WASH WASH WASH them before putting them in the boiling water. They will have a gritting texture to them if you skip this step and your guests will think you have served them dirt with their greens. Once the greens are good and clean, remove the stem from each leaf....that's right, one by one, go through and tear that tough old stem right off the leaves! 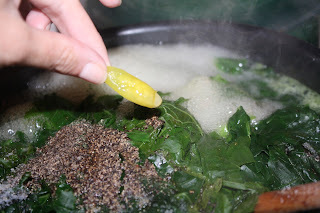 Add the greens gradually to a pot of boiling water. It will appear that there is no way you are going to be able to fit them all in a pot but they cook down quickly! Season with salt, pepper and a heaping tablespoon of bacon grease. 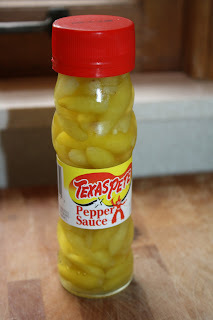 Sometimes, especially when my brother is going to be eating these, I like to add a hot pepper! One is plenty so don't get grabby! Stir everything together and let it cook, cook, cook. Depending on how much time you have these can cook for an hour or they can simmer on the stove for 4 hours. If you are going to let them simmer just keep an eye on them as you may need to add more water to make sure they don't dry out. Just always make sure they are covered in water. When I am ready to serve them I like to drain them, mainly because I don't like my food to touch and this prevents rogue juices from creeping into my mashed potatoes but this is purely a preference thing! Serve hot with a side of cornbread and a healthy appetite!